StorySlam 2018: Rooted and Rising was a success! We’re so grateful for our sponsors, storytellers, committee, volunteers, and guests who made the evening possible. Check out the highlights over on our Insta. Back for its second year, StorySlam 2018: Rooted and Rising promises to be an evening of delicious food, connection, and powerful storytelling from our Bay Area food community. Francis Ang is the chef/owner of Pinoy Heritage, a Filipino pop-up restaurant. Having spent more than a decade in the kitchens of Gary Danko, Fifth Floor, Dirty Habit and Taj Campton, Francis has been recognized in Zagat’s “30 Under 30” and as a 2018 SF Chronicle Rising Star Chef. Francis’ mission for Pinoy Heritage is to exhibit the evolution of traditional Filipino flavors, through his culinary researches focusing around California produce. Stuart Brioza and Nicole Krasinski are the Chef/Owners of State Bird Provisions and The Progress in San Francisco. After helming the kitchen at legendary restaurants, Tapawingo in Ellsworth, Michigan and San Francisco institution, Rubicon, Stuart and Nicole opened the award-winning State Bird Provisions on December 31st, 2011. In December of 2014, Stuart and Nicole opened sister-restaurant, The Progress, to critical acclaim. By following their own style, they are committed to changing perceptions around dining and service. They are driven to consistently provide a unique environment where people can expect interesting food, distinctive wines, and meaningful service. To do this, they remain focused on, support and respect the foundations of their businesses: their staff and purveyors. Most recently Stuart and Nicole released State Bird Provisions: A Cookbook with writer JJ Goode and Ten Speed Press. Born and raised in the foodie and cultural capital Mumbai India, Amisha brings a cosmopolitan flair to her food endeavors. As a working engineer, with a Master’s degree in Computer Science from University of Southern CA, Amisha’s restless curiosity for the culinary arts, has led her down the entrepreneurial path to Jam Lab jams, focusing on unique flavor combinations with only in season and organic fruit. Jam Lab kick started her passion for recipe development, and further explorations into unique combinations, utilizing her Indian Gujarati heritage with the seasonal bounty of California, showcasing her recipes on her food blog. Her multi-cultural background has been instrumental in frequent collaborations with brands such as Williams Sonoma, Sur La Table, Sunset Magazine, Bakefeed Magazine and Feedfeed etc. Amisha currently resides with her husband and two kids in Nothern CA. Leslie Jonath has over 20 years experience in creative services, content creation, and book publishing. She is founder and creative director of Connected Dots Media, where she creates branded and original content. She is also the author of numerous cookbooks and kids books including Postmark Paris (winner of the Book Builder’s Gold Award) and Bee & Me, New York Times Bestseller, Love Found, Foraged Art, and most recently Feed Your People: Big-Batch, Big-Hearted Cooking and Recipes to Gather Around which she did in collaboration with the non-profit 18 Reasons. Other food books she produced include The Pleasure of Slow Food with Corby Kummer; Fields of Plenty with Michael Ableman and a other cause-related projects like From Our House to Yours to benefit Meals on Wheels of San Francisco. Before founding Connected Dots Media, she was an editor and a Creative Director at Chronicle Books for 18 years where she conceptualized, produced custom projects for brands, retailers and cultural institutions. J. Kenji López-Alt is the author of the New York Times Best-Selling cookbook "The Food Lab: Better Home Cooking Through Science," the Chief Culinary Consultant at Serious Eats, and the Chef/Partner of Wursthall in San Mateo, CA. He lives in San Mateo with his wife Adriana, his daughter Alícia, and their two dogs, Jamón and Shabu. His first book, The Food Lab: Better Home Cooking Through Science is available now. At nearly 1,000 pages with over 300 foolproof recipes, it's a grand tour of the science of cooking explored through popular American dishes, illustrated in full color with thousands of photographs, charts, graphs, and do-at-home experiments. A native of San Francisco, Fernay began her culinary journey with Minnie Bell's catering and teaching youth cooking classes in the Fillmore district of SF. Partnering with La Cocina, Urban Solutions and Main Street Launch, Fernay has grown her business through roving pop-ups and by catering to big companies. In 2017, Fernay was chosen as one of SF Chronicle Rising Star Chefs. Minnie Bell's currently has a home inside The Public Market Emeryville. Neka Pasquale L.Ac. MS is a licensed Acupuncturist, Author and the Founder of Urban Remedy. She created Urban Remedy as a natural evolution of her passion for health and healing and living a lifestyle with “food is healing” as her mantra. Growing up in the farm-to-table culture of Northern California, Neka was inspired by people who care about what they eat and who strive to eat for health as well as pleasure. In her private practice of over a decade, Neka combined acupuncture and Chinese medicine with cutting-edge nutrition and lifestyle modifications to heal, balance and create optimal health. Neka started leading wellness retreats with her patients and over and over again they described experiencing life-changing results after just a few days. Inspired by these transformations, Neka knew she had found her calling and in 2009, Urban Remedy was born. Michelle Tam is the creator of the Saveur Award winning food blog, Nom Nom Paleo. Together with her husband, Henry Fong, she also produced a Webby award winning cooking app, authored two New York Times bestselling cookbooks, and was nominated for a James Beard Award. Michelle has a degree in nutrition and food science from the University of California at Berkeley, and a doctorate in pharmacy from UCSF. For over a dozen years, she worked the graveyard shift at Stanford Hospital and Clinics as a night pharmacist before her side hustle became her main hustle. 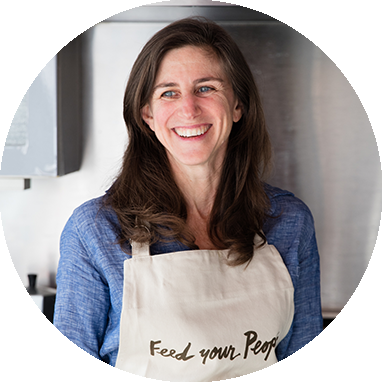 Lorraine Walker is a native San Franciscan and a lover of food, sharing the world of local and seasonal eating with anyone who will listen. Her love of cooking started at the young age of 5 when she would sneak into the kitchen early in the morning to make breakfast. Within a few years, she was demanding to make dinners and hasn’t stopped since. Since the age of 23, Lorraine has worked in various aspects of the natural products industry, where she eventually met Nigel Walker, founder of Eatwell Farm. They married, and with Nigel's encouragement, she started her own side project producing lacto-fermented drinks called Drinkwell Softers. After losing her husband to cancer in July 2017, Lorraine became a reluctant farmer, taking over the helm at Eatwell Farm. Since then, Lorraine and her son Cameron have been on an intense crash course in farming and managing one of the Bay Area’s top CSA’s. General Admission tickets include dinner and unlimited beverages (beer, wine, and kombucha on tap) provided by Airbnb and dessert provided by Coletta Gelato, Alter Eco, and Barr Necessities. VIP tickets also include access to the VIP Reception beginning at 5p and early access to dinner. A number of inclusive tickets are available thanks to the support of New Resource Bank. If the tickets to this event are out of your price range, please email kelly@realfoodrealstories.org for more information.